Recent review: He was on time and played beautifully. Solo trumpet player available for any kind of gig, from weddings to jazz bands, from lessons to orchestras. It's ok for these guys to toot their own horn because when they do it sounds good! Think of the music of Miles Davis and Louis Armstrong. Now bring that music and energy to your event with one of these fantastic trumpet players! Want the trumpet use it's music to bring you down the aisle, or maybe you need a trumpet for a jazz night at your club? Well GigSalad is here to fix all your trumpeting needs! 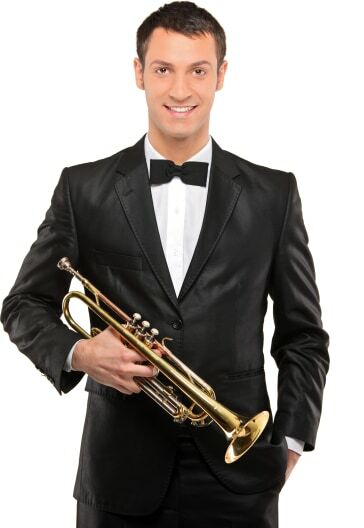 With trumpeters from jazz to herald trumpeteers you are sure to find the right trumpet player for your event. Search for Trumpet Players in Morristown, New Jersey above. Please note that these Trumpet Players may also travel to Cedar Knolls, Greystone Park, Morris Plains, Hanover Township, Whippany, Green Village, New Vernon, Brookside, Mount Freedom, Florham Park, Mount Tabor, Mendham, Chatham, East Hanover, Bernardsville, Mountain Lakes, Rockaway, Gillette, Ironia, New Providence, Picatinny Arsenal, Lake Hiawatha, Mine Hill, Stirling, Lyons, Millington, Berkeley Heights, Boonton, Basking Ridge, and Pine Brook.